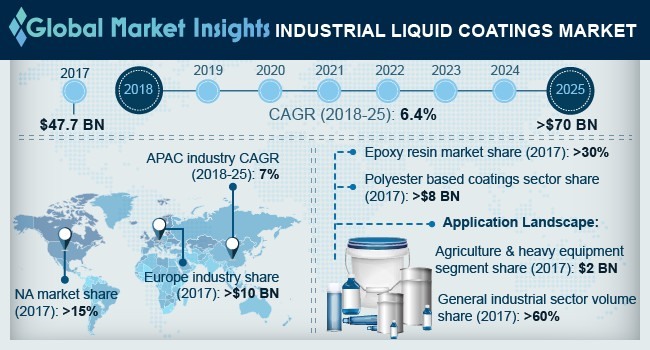 Industrial Liquid Coatings Market size will surpass USD 70 billion by 2025; according to a new research report by Global Market Insights, Inc.
Growth in the global oil & gas sector coupled with supportive government policies of emerging economies to boost manufacturing sector are the prime factor for the growth of industrial liquid coatings market in near future. The coatings are used to provide resistance to corrosion, UV rays, acids, oils and other type of contaminations that can deteriorate metal and hinder the performance of equipments. The product is mainly applied on various industrial metal equipments, components and pipelines. Upliftment of ban from the U.S. oil exports will spur the growth of pipeline network in the region. The largest network of pipelines in the world is present in North America, with the U.S. alone accounting for more than 115 thousand kilometers of crude oil pipeline. It is expected that North America will witness additions of around 60 thousand kilometers of pipeline network by 2021. This trend is expected to follow with the new U.S. administration’s vision of reducing energy dependence on other nations. All these facts will contribute to the product market growth in forecast timespan. Stringent environmental regulation related to the VOC emission from liquid coatings will negatively impact on the growth of global industrial liquid coatings market. Solvents used in coating formulations are hazardous as many are human carcinogens and are flammable or explosive. Environmental concerns associated with conventional ingredients, coating application technologies, and coating wastes are the driving forces for developing pollution prevention alternatives. Industrial liquid coatings market is segregated into resin, product, application and region. The resin segment includes epoxy, acrylic, polyester, polyurethane and others. In terms of volume, acrylic based coatings segment will clutch over 15% of the entire market share in 2025. Properties such as excellent chemical resistance, color & gloss retention, outstanding early moisture resistance, flash rust/early rust resistance, etc. makes it suitable for use over steel, aluminum, and zinc rich primers. These coatings have wide end-use application on equipment, machineries, power plants, piping and steel structures as well. The product segment further segmented into liquid top coats, liquid primers, metal conditioners, e-coats and other. In terms of revenue, e-coats will account for more than 10% of the overall segment share by 2025. E-coats or electrocoats are high-performance products that are formulated to provide reliable mechanical strength and superior corrosion protection. The product is mostly used on hot rolled steel, galvanized steel, aluminum, magnesium etc. in agriculture, construction & earthmoving equipments, as well as automotive & electrical appliances manufacturing industries. General industrial segment is likely to clutch the highest share of over 60% by 2025 with a wide range of industries covered under this segment. It includes industries such as home appliance manufacturing, food & beverage, textiles, steel, pharmaceutical, containers and packaging, etc. Growing demand for various household products due to rise in spending capacity of the global population will result in growth of general industrial sector. Based on volume, Asia Pacific industrial liquid coatings market will witness the growth rate around 7%. Significant rise in manufacturing industries in Asian Countries such as China, South Korea and India will subsequently augment the entire industry demand in future. The industrial liquid coatings market is very fragmented as numerous large, medium and small players are present in the industry across the globe. Some of the key industry giants are Nippon Paints, Hempel, Axalta Coating, Kansai Paint, Akzo Nobel, Baril Coatings, and RPM International.